Salicylic Acid is *the* must-have ingredient you need to tackle breakouts. Deeply cleansing, exfoliating, yet soothing, salicylic acid unclogs pores and controls oil production. Hello Salicylic Acid Kit, Goodbye problem skin!. Salicylic Acid Day Pads: Reduce shine + decongest the skin with the new Teen Skin Salicylic Acid Day Pads. 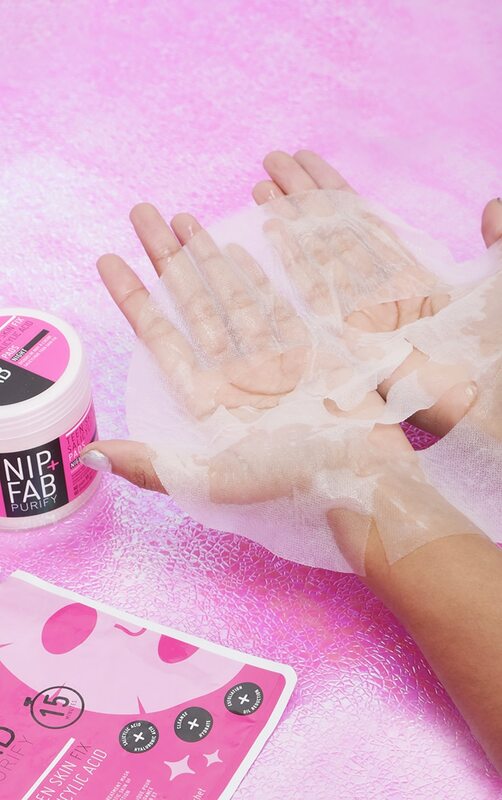 Each pad is infused with salicylic acid as well as Egyptian + Asian lotus flower extracts to unclog pores + reduce excess oil production, + aloe vera to reduce redness + hydrate the skin. 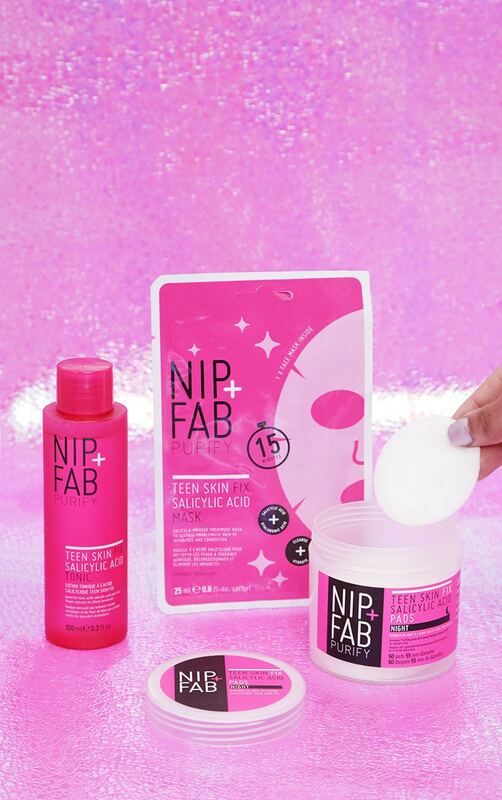 Salicylic Acid Sheet Mask: A high-performance blend of hyaluronic + salicylic acid create the perfect combination for congested skin with the addition of lotus flower extract to cleanse troubled skin without stripping or drying the complexion. 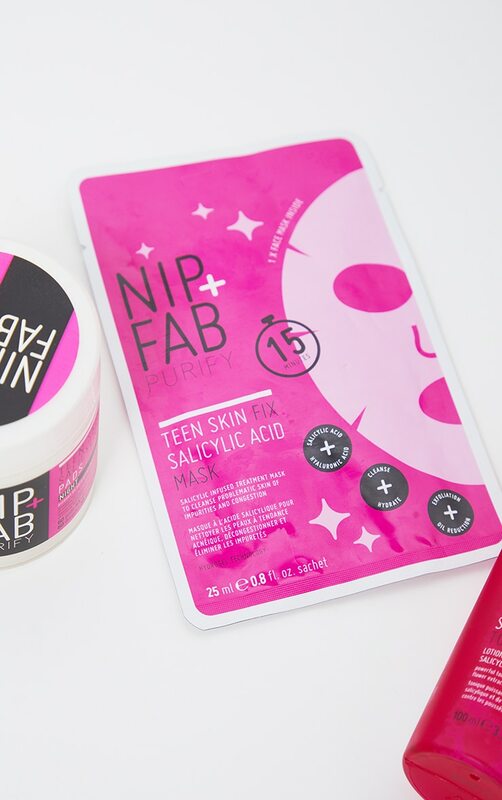 Salicylic Acid Night Pads: Stop breakouts in their tracks with the new Teen Skin Salicylic Acid Night Pads. Formulated to reduce breakouts with potent salicylic acid + a skin protective complex to support the healing process of active breakouts, to speed up recovery time. Salicylic Acid Tonic: Target blemishes + reveal radiant skin with the new Teen Skin Salicylic Acid Tonic; a fast-acting solution which exfoliates + unclogs pores, clears blackheads and thoroughly cleanses congested skin. The tonic contains blemish-fighting 1% salicylic acid and sebum-reducing lotus flower to prevent breakouts without stripping the skin. Salicylic Acid Day Pads: Aqua (Water), Glycerin, Butylene Glycol, Propylene Glycol, PEG-40 Hydrogenated Castor Oil, Salicylic Acid, Propanediol, Phenoxyethanol, Sodium Hydroxide, Benzyl Alcohol, Parfum (Fragrance), Disodium EDTA, Panthenol, Ethylhexylglycerin, Benzyl Salicylate, Dehydroacetic Acid, Aloe Barbadensis Leaf Juice Powder, Sodium Hyaluronate, Nelumbo Nucifera Flower Extract, Nymphaea Coerulea Flower Extract. Salicylic Acid Night Pads:Aqua (Water), Glycerin, Butylene Glycol, Propylene Glycol, Salvia Hispanica Seed Extract,Salicylic Acid, Propanediol, Phenoxyethanol, Benzyl Alcohol, Parfum (Fragrance), Aloe Barbadensis Leaf Juice Powder, Disodium EDTA, Panthenol, Sodium Hydroxide, Lactobacillus Ferment, Benzyl Salicylate, Dehydroacetic Acid, Sodium Hyaluronate, Nelumbo Nucifera Flower Extract, Nymphaea Coerulea Flower Extract. Salicylic Acid Tonic:Aqua (Water), Polysorbate 20, Hamamelis Virginiana (Witch Hazel) Water, PEG-40 Hydrogenated Castor Oil, Salicylic Acid, Propanediol, Alcohol, Glycerin, Sodium Hydroxymethylglycinate, Allantoin, Disodium EDTA, Panthenol, Parfum (Fragrance), Sodium Hydroxide, Benzyl Salicylate, Sodium Hyaluronate, Nelumbo Nucifera Flower Extract, Nymphaea Coerulea Flower Extract.